Geese can be very aggressive and some people even use them to guard property. Migrating geese can travel over 3000 miles. Geese were the first poultry domesticated by humans approximately 3000 years ago. 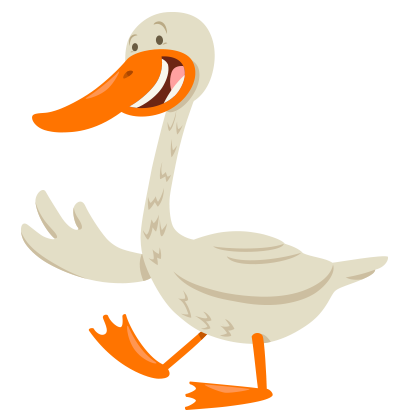 A male is known as a GANDER, a female is known as a GOOSE and a baby is known as a GOSLING. A group is known as a GAGGLE. Geese are waterfowl belonging to the tribe Anserini Geese are monogamous, living in permanent pairs throughout the year; however, unlike most other permanently monogamous animals, they are territorial only during the short nesting season. Paired geese are more dominant and feed more, two factors that result in more young. Geese return to the area of their birth each year to mate and nest. Molting season runs from early June to late July. LONGEVITY: Can live 10 to 24 years. WEIGHT: They weigh between 3.2 and 6.5 kilos. SIZE: Can grow between 75cm and 100cm. Wingspan of 127cm and 175cm. DIET: Geese are primarily herbivores, although they sometimes eat small insects and fish. Their diet includes green vegetation and grains. The Canada Goose eats a variety of grasses when on land. It feeds by grasping a blade of grass with the bill, then tearing it with a jerk of the head. The Canada Goose also eats beans and grains such as wheat, rice, and corn when they are available. In the water, it feeds from silt at the bottom of the body of water. It also feeds on aquatic plants, such as seaweeds. GESTATION: Mating season is February to early April. When a clutch of eggs are laid, incubation takes around 28 days.